Within this figure, the research suggests that even if an extra 5,000 new apprentices qualified by 2023 (representing a 33% increase), this would still leave a shortfall of 7,500-10,000 electricians needing to be sourced from elsewhere. These workforce predictions are based on meeting demands solely due to sector expansion, and do not cover the additional staff turnover occurring from leavers and retirement. Emerging and future technologies are expected to be major drivers for this increase in skills needs over the next decade, with smart technology, e-mobility and Wi-Fi technology named as the top three forces for change. Other areas that are likely to influence the sector include changes to regulations and public policy, in areas such as energy efficiency and fire safety. Whilst the largest proportion of the UK workforce is between 25 and 49 years old, in England and Wales, only around 15% of the workforce is under the age of 25; compared to 24% for Scotland and Northern Ireland. 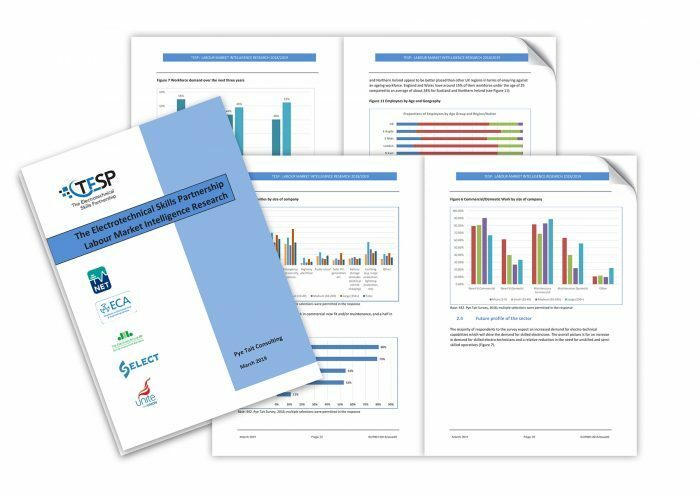 Commissioned by The Electrotechnical Skills Partnership (TESP) and co-funded with industry charity, National Electrotechnical Training (NET), the report is the first to provide an in-depth analysis of electrotechnical skills needs in over 10 years. Research specialist Pye Tait compiled the report after surveying almost 450 electrotechnical companies, with around 19,000 employees. However, the number of apprentices currently recruited each year is insufficient to meet projected demands, and employers identify various barriers to further recruitment, including some candidates’ attitudes and behaviours. They believe more needs to be done to widen the potential pool of applicants, and the calibre and diversity of new entrants – for example, through improved industry engagement with colleges and schools, and further development of alternative routes into the industry for college leavers, career changers and others from older age groups. In response to the report and its findings, TESP is now developing an industry action plan to tackle the issues and recommendations raised. Work is already underway in several areas, including the development of new careers resources, promotion of industry-recognised qualifications and activity to forge closer ties between industry, schools and further education. The action plan will also take account of the large numbers of small and micro businesses in the industry, including sole traders, and how these might be better supported in future.